(Chris Detrick | The Salt Lake Tribune) Participants cheer during the March for Our Lives SLC rally at the state Capitol Saturday, March 24, 2018. The student-led March for Our Lives SLC got underway about 11:30 a.m. with what police estimated were 8,000 participants walking from Salt Lake City’s West High School to the front steps of the state Capitol. (Chris Detrick | The Salt Lake Tribune) Participants march from West High School to the state Capitol during the March for Our Lives SLC Saturday, March 24, 2018. The student-led March for Our Lives SLC got underway about 11:30 a.m. with what police estimated were 8,000 participants walking from Salt Lake City’s West High School to the front steps of the state Capitol. (Chris Detrick | The Salt Lake Tribune) Participants march from West High School to the state Capitol during the March for Our Lives SLC Saturday, March 24, 2018. The student-led March for Our Lives SLC got underway about 11:30 a.m. with what police estimated were 8,000 participants walking from Salt Lake CityÕs West High School to the front steps of the state Capitol. (Chris Detrick | The Salt Lake Tribune) Participants hold signs during the March Before Our Lives rally near West High School in Salt Lake City Saturday, March 24, 2018. (Chris Detrick | The Salt Lake Tribune) Participants hold signs during the March Before Our Lives rally near West High School in Salt Lake City Saturday, March 24, 2018. (Chris Detrick | The Salt Lake Tribune) Participants hold signs during the March Before Our Lives rally near West High School in Salt Lake City Saturday, March 24, 2018. (Chris Detrick | The Salt Lake Tribune) Participants yell at people gathered for the March for Our Lives rally during the March Before Our Lives rally near West High School in Salt lake City Saturday, March 24, 2018. (Chris Detrick | The Salt Lake Tribune) Participants hold signs during the March Before Our Lives rally near West High School in Salt Lake City Saturday, March 24, 2018. (Chris Detrick | The Salt Lake Tribune) Participants hold signs as the March Before Our Lives rally walks by during the March for Our Lives rally West High School in Salt Lake City Saturday, March 24, 2018. (Chris Detrick | The Salt Lake Tribune) Participants hold signs during the March Before Our Lives rally near West High School in Salt Lake City Saturday, March 24, 2018. (Chris Detrick | The Salt Lake Tribune) People wave to participants as they march from West High School to the state Capitol during the March for Our Lives SLC Saturday, March 24, 2018. The student-led March for Our Lives SLC got underway about 11:30 a.m. with what police estimated were 8,000 participants walking from Salt Lake CityÕs West High School to the front steps of the state Capitol. (Chris Detrick | The Salt Lake Tribune) Participants hold signs during the March Before Our Lives rally near West High School in Salt Lake City Saturday, March 24, 2018. (Chris Detrick | The Salt Lake Tribune) Participants march from West High School to the state Capitol during the March for Our Lives SLC Saturday, March 24, 2018. The student-led March for Our Lives SLC got underway about 11:30 a.m. with what police estimated were 8,000 participants walking from Salt Lake CityÕs West High School to the front steps of the state Capitol. (Chris Detrick | The Salt Lake Tribune) Participants march from West High School to the state Capitol during the March for Our Lives SLC Saturday, March 24, 2018. The student-led March for Our Lives SLC got underway about 11:30 a.m. with what police estimated were 8,000 participants walking from Salt Lake CityÕs West High School to the front steps of the state Capitol. (Chris Detrick | The Salt Lake Tribune) Participants hold signs during the March Before Our Lives rally near West High School in Salt Lake City Saturday, March 24, 2018. (Scott Sommerdorf | The Salt Lake Tribune) The pro gun March Before Our lives rallied at the Utah State Capitol after their march from West High School, Saturday, March 24, 2018. Scott Sommerdorf | The Salt Lake Tribune David Woodward, a teacher at Ascent Academy in Farmington, marched with his daughter as pro gun March Before Our Lives marchers rallied across the street from West High School, Saturday, March 24, 2018. (Scott Sommerdorf | The Salt Lake Tribune) The pro gun March Before Our lives rallied at the Utah State Capitol after their march from West High School, Saturday, March 24, 2018. (Scott Sommerdorf | The Salt Lake Tribune) The pro gun March Before Our lives marchers rally at West High School, Saturday, March 24, 2018. (Chris Detrick | The Salt Lake Tribune) Participants listen during the March for Our Lives SLC rally at the state Capitol Saturday, March 24, 2018. The student-led March for Our Lives SLC got underway about 11:30 a.m. with what police estimated were 8,000 participants walking from Salt Lake CityÕs West High School to the front steps of the state Capitol. (Chris Detrick | The Salt Lake Tribune) Participants march from West High School to the state Capitol during the March for Our Lives SLC Saturday, March 24, 2018. The student-led March for Our Lives SLC got underway about 11:30 a.m. with what police estimated were 8,000 participants walking from Salt Lake CityÕs West High School to the front steps of the state Capitol. (Chris Detrick | The Salt Lake Tribune) Participants listen during the March for Our Lives SLC rally at the state Capitol Saturday, March 24, 2018. The student-led March for Our Lives SLC got underway about 11:30 a.m. with what police estimated were 8,000 participants walking from Salt Lake City's West High School to the front steps of the state Capitol. (Chris Detrick | The Salt Lake Tribune) Participants listen during the March for Our Lives SLC rally at the state Capitol Saturday, March 24, 2018. The student-led March for Our Lives SLC got underway about 11:30 a.m. with what police estimated were 8,000 participants walking from Salt Lake CityÕs West High School to the front steps of the state Capitol. Scott Sommerdorf | The Salt Lake Tribune Zach Dunn of Salt Lake City carried his Glock 9mm as he rallied with other pro-gun March Before Our lives marchers across the street from West High School, Saturday, March 24, 2018. (Scott Sommerdorf | The Salt Lake Tribune) The pro gun March Before Our lives marchers begin their march to the Capitol building from West High School, Saturday, March 24, 2018. (Scott Sommerdorf | The Salt Lake Tribune) The pro gun March Before Our lives marchers march up State Street to the Utah State Capitol building, Saturday, March 24, 2018. (Scott Sommerdorf | The Salt Lake Tribune) The pro gun March Before Our lives rallied at the Utah State Capitol after their march from West High School, Saturday, March 24, 2018. (Chris Detrick | The Salt Lake Tribune) Participants listen during the March for Our Lives SLC rally at the state Capitol Saturday, March 24, 2018. The student-led March for Our Lives SLC got underway about 11:30 a.m. with what police estimated were 8,000 participants walking from Salt Lake City’s West High School to the front steps of the state Capitol. (Chris Detrick | The Salt Lake Tribune) Ermiya Fanaeian and other participants march from West High School to the state Capitol during the March for Our Lives SLC Saturday, March 24, 2018. The student-led March for Our Lives SLC got underway about 11:30 a.m. with what police estimated were 8,000 participants walking from Salt Lake CityÕs West High School to the front steps of the state Capitol. (Chris Detrick | The Salt Lake Tribune) Participants listen during the March for Our Lives SLC rally at the state Capitol Saturday, March 24, 2018. The student-led March for Our Lives SLC got underway about 11:30 a.m. with what police estimated were 8,000 participants walking from Salt Lake CityÕs West High School to the front steps of the state Capitol. (Chris Detrick | The Salt Lake Tribune) Participants hold up the peace sign as they listen to John Lennon's song 'Imagine' during the March for Our Lives SLC at the state Capitol Saturday, March 24, 2018. The student-led March for Our Lives SLC got underway about 11:30 a.m. with what police estimated were 8,000 participants walking from Salt Lake City’s West High School to the front steps of the state Capitol. Scott Sommerdorf | The Salt Lake Tribune A woman with a pro-NRA shirt held a baby as pro-gun March Before Our Lives marchers rallied across the street from West High School, Saturday, March 24, 2018. Scott Sommerdorf | The Salt Lake Tribune Pro-gun March Before Our lives marchers rally across the street from West High School, Saturday, March 24, 2018. (Scott Sommerdorf | The Salt Lake Tribune) Pro-gun March Before Our lives marchers shout at members of the media as they march up State Street to the Utah State Capitol building, Saturday, March 24, 2018. (Scott Sommerdorf | The Salt Lake Tribune) The pro gun March Before Our lives rallied at the Utah State Capitol after their march from West High School, Saturday, March 24, 2018. Scott Sommerdorf | The Salt Lake Tribune A man who refused to give his name because he claimed he was mis-identified as a counter protestor at a previous rally stood with pro-gun March Before Our lives marchers as they rallied across the street from West High School, Saturday, March 24, 2018. (Chris Detrick | The Salt Lake Tribune) Saida Dahir speaks during the March for Our Lives SLC at the state Capitol Saturday, March 24, 2018. The student-led March for Our Lives SLC got underway about 11:30 a.m. with what police estimated were 8,000 participants walking from Salt Lake CityÕs West High School to the front steps of the state Capitol. Scott Sommerdorf | The Salt Lake Tribune Students chant on the steps of the State Capitol near the end of their rally for thousands on the south lawn after they marched from West High School, Saturday, March 24, 2018. (Chris Detrick | The Salt Lake Tribune) Participants hold signs as the March BeFOR Our Lives' rally walks by during the March for Our Lives' rally West High School in Salt lake City Saturday, March 24, 2018. (Chris Detrick | The Salt Lake Tribune) Participants hold signs as the March BeFOR Our Lives' rally walks by during the March for Our Lives' rally West High School in Salt lake City Saturday, March 24, 2018. (Chris Detrick | The Salt Lake Tribune) Danielle Creer 14, right, and Grace Meservy, 15, listen during the March for Our Lives SLC rally at the state Capitol Sunday, March 25, 2018. The student-led March for Our Lives SLC got underway about 11:30 a.m. with what police estimated were 8,000 participants walking from Salt Lake City’s West High School to the front steps of the state Capitol. (Chris Detrick | The Salt Lake Tribune) Participants listen during the March for Our Lives SLC rally at the state Capitol Saturday, March 24, 2018. The student-led March for Our Lives SLC got underway about 11:30 a.m. with what police estimated were 8,000 participants walking from Salt Lake CityÕs West High School to the front steps of the state Capitol. (Chris Detrick | The Salt Lake Tribune) Participants listen during the March for Our Lives SLC rally at the state Capitol Saturday, March 24, 2018. The student-led March for Our Lives SLC got underway about 11:30 a.m. with what police estimated were 8,000 participants walking from Salt Lake City’s West High School to the front steps of the state Capitol. (Chris Detrick | The Salt Lake Tribune) Participants listen during the March for Our Lives SLC rally at the state Capitol Saturday, March 24, 2018. The student-led March for Our Lives SLC got underway about 11:30 a.m. with what police estimated were 8,000 participants walking from Salt Lake CityÕs West High School to the front steps of the state Capitol. (Chris Detrick | The Salt Lake Tribune) Participants listen during the March for Our Lives SLC rally at the state Capitol Saturday, March 24, 2018. The student-led March for Our Lives SLC got underway about 11:30 a.m. with what police estimated were 8,000 participants walking from Salt Lake City’s West High School to the front steps of the state Capitol. (Chris Detrick | The Salt Lake Tribune) Saida Dahir speaks during the March for Our Lives SLC at the state Capitol Saturday, March 24, 2018. The student-led March for Our Lives SLC got underway about 11:30 a.m. with what police estimated were 8,000 participants walking from Salt Lake CityÕs West High School to the front steps of the state Capitol. (Chris Detrick | The Salt Lake Tribune) Participants listen during the March for Our Lives SLC rally at the state Capitol Saturday, March 24, 2018. The student-led March for Our Lives SLC got underway about 11:30 a.m. with what police estimated were 8,000 participants walking from Salt Lake City’s West High School to the front steps of the state Capitol. (Chris Detrick | The Salt Lake Tribune) Participants listen during the March for Our Lives SLC rally at the state Capitol Saturday, March 24, 2018. The student-led March for Our Lives SLC got underway about 11:30 a.m. with what police estimated were 8,000 participants walking from Salt Lake City’s West High School to the front steps of the state Capitol. (Chris Detrick | The Salt Lake Tribune) Ermiya Fanaeian and other participants march from West High School to the state Capitol during the March for Our Lives SLC Saturday, March 24, 2018. The student-led March for Our Lives SLC got underway about 11:30 a.m. with what police estimated were 8,000 participants walking from Salt Lake CityÕs West High School to the front steps of the state Capitol. (Chris Detrick | The Salt Lake Tribune) Participants hold up the peace sign as they listen to John Lennon's song 'Imagine' during the March for Our Lives SLC at the state Capitol Saturday, March 24, 2018. The student-led March for Our Lives SLC got underway about 11:30 a.m. with what police estimated were 8,000 participants walking from Salt Lake City’s West High School to the front steps of the state Capitol. (Chris Detrick | The Salt Lake Tribune) Participants march from West High School to the state Capitol during the March for Our Lives SLC Saturday, March 24, 2018. The student-led March for Our Lives SLC got underway about 11:30 a.m. with what police estimated were 8,000 participants walking from Salt Lake City’s West High School to the front steps of the state Capitol. (Chris Detrick | The Salt Lake Tribune) Participants listen during the March for Our Lives SLC rally at the state Capitol Saturday, March 24, 2018. The student-led March for Our Lives SLC got underway about 11:30 a.m. with what police estimated were 8,000 participants walking from Salt Lake CityÕs West High School to the front steps of the state Capitol. (Chris Detrick | The Salt Lake Tribune) Participants march from West High School to the state Capitol during the March for Our Lives SLC Saturday, March 24, 2018. The student-led March for Our Lives SLC got underway about 11:30 a.m. with what police estimated were 8,000 participants walking from Salt Lake CityÕs West High School to the front steps of the state Capitol. (Chris Detrick | The Salt Lake Tribune) Participants hold up the peace sign as they listen to John Lennon's song 'Imagine' during the March for Our Lives SLC at the state Capitol Saturday, March 24, 2018. The student-led March for Our Lives SLC got underway about 11:30 a.m. with what police estimated were 8,000 participants walking from Salt Lake CityÕs West High School to the front steps of the state Capitol. (Chris Detrick | The Salt Lake Tribune) Participants march from West High School to the state Capitol during the March for Our Lives SLC Saturday, March 24, 2018. The student-led March for Our Lives SLC got underway about 11:30 a.m. with what police estimated were 8,000 participants walking from Salt Lake City’s West High School to the front steps of the state Capitol. (Chris Detrick | The Salt Lake Tribune) Participants listen during the March for Our Lives SLC rally at the state Capitol Sunday, March 25, 2018. The student-led March for Our Lives SLC got underway about 11:30 a.m. with what police estimated were 8,000 participants walking from Salt Lake CityÕs West High School to the front steps of the state Capitol. (Chris Detrick | The Salt Lake Tribune) Participants march from West High School to the state Capitol during the March for Our Lives SLC Saturday, March 24, 2018. The student-led March for Our Lives SLC got underway about 11:30 a.m. with what police estimated were 8,000 participants walking from Salt Lake CityÕs West High School to the front steps of the state Capitol. (Chris Detrick | The Salt Lake Tribune) Participants march from West High School to the state Capitol during the March for Our Lives SLC Saturday, March 24, 2018. The student-led March for Our Lives SLC got underway about 11:30 a.m. with what police estimated were 8,000 participants walking from Salt Lake CityÕs West High School to the front steps of the state Capitol. (Chris Detrick | The Salt Lake Tribune) People wave to participants as they march from West High School to the state Capitol during the March for Our Lives SLC Saturday, March 24, 2018. 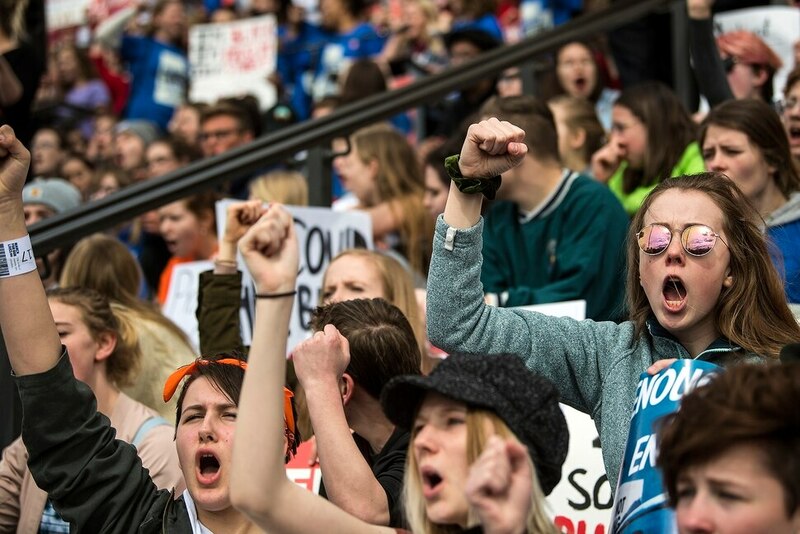 The student-led March for Our Lives SLC got underway about 11:30 a.m. with what police estimated were 8,000 participants walking from Salt Lake CityÕs West High School to the front steps of the state Capitol. (Chris Detrick | The Salt Lake Tribune) Participants march from West High School to the state Capitol during the March for Our Lives SLC Saturday, March 24, 2018. The student-led March for Our Lives SLC got underway about 11:30 a.m. with what police estimated were 8,000 participants walking from Salt Lake City’s West High School to the front steps of the state Capitol. (Chris Detrick | The Salt Lake Tribune) Participants march from West High School to the state Capitol during the March for Our Lives SLC Saturday, March 24, 2018. The student-led March for Our Lives SLC got underway about 11:30 a.m. with what police estimated were 8,000 participants walking from Salt Lake CityÕs West High School to the front steps of the state Capitol. (Chris Detrick | The Salt Lake Tribune) Participants listen during the March for Our Lives SLC rally at the state Capitol Sunday, March 25, 2018. The student-led March for Our Lives SLC got underway about 11:30 a.m. with what police estimated were 8,000 participants walking from Salt Lake CityÕs West High School to the front steps of the state Capitol. (Chris Detrick | The Salt Lake Tribune) Participants listen during the March for Our Lives SLC rally at the state Capitol Sunday, March 25, 2018. The student-led March for Our Lives SLC got underway about 11:30 a.m. with what police estimated were 8,000 participants walking from Salt Lake CityÕs West High School to the front steps of the state Capitol. (Chris Detrick | The Salt Lake Tribune) Participants listen during the March for Our Lives SLC rally at the state Capitol Sunday, March 25, 2018. The student-led March for Our Lives SLC got underway about 11:30 a.m. with what police estimated were 8,000 participants walking from Salt Lake CityÕs West High School to the front steps of the state Capitol. (Chris Detrick | The Salt Lake Tribune) Participants listen during the March for Our Lives SLC rally at the state Capitol Sunday, March 25, 2018. The student-led March for Our Lives SLC got underway about 11:30 a.m. with what police estimated were 8,000 participants walking from Salt Lake CityÕs West High School to the front steps of the state Capitol. (Chris Detrick | The Salt Lake Tribune) Participants listen during the March for Our Lives SLC rally at the state Capitol Saturday, March 24, 2018. The student-led March for Our Lives SLC got underway about 11:30 a.m. with what police estimated were 8,000 participants walking from Salt Lake CityÕs West High School to the front steps of the state Capitol. (Chris Detrick | The Salt Lake Tribune) Participants march from West High School to the state Capitol during the March for Our Lives SLC Saturday, March 24, 2018. The student-led March for Our Lives SLC got underway about 11:30 a.m. with what police estimated were 8,000 participants walking from Salt Lake CityÕs West High School to the front steps of the state Capitol. (Chris Detrick | The Salt Lake Tribune) Participants listen during the March for Our Lives SLC rally at the state Capitol Saturday, March 24, 2018. The student-led March for Our Lives SLC got underway about 11:30 a.m. with what police estimated were 8,000 participants walking from Salt Lake City’s West High School to the front steps of the state Capitol. Scott Sommerdorf | The Salt Lake Tribune A man climbed op on a concrete abutment to photograph the huge crowd on the south lawn of the Utah State Capitol for the For Our lives rally, Saturday, March 24, 2018. Scott Sommerdorf | The Salt Lake Tribune Part of the huge crowd on the south lawn of the Utah State Capitol for the For Our lives rally, Saturday, March 24, 2018. Scott Sommerdorf | The Salt Lake Tribune Part of the huge crowd on the south lawn of the Utah State Capitol for the For Our lives rally, Saturday, March 24, 2018. High school students looped handmade price tags to their wrists and jackets. Their lives, they said, are not as valuable to lawmakers as guns. Less than a block away, Second Amendment advocates holstered pistols on their waists and slung assault rifles across their backs. They won’t let their constitutional right be taken away. The two groups with dueling ideologies gathered Saturday in Salt Lake City to continue a national discussion sparked by the deadly February shooting at a Florida high school that left 17 dead. They set off separately, with marches staggered about two hours apart, but ended brushing shoulders at the Utah Capitol. 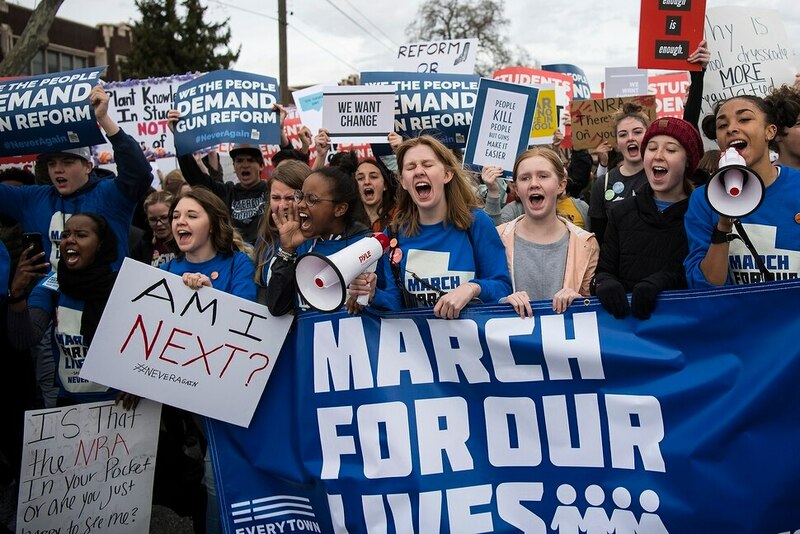 Police estimated a landmark 8,000 people took part in the March for Our Lives SLC, with participants walking from West High School to the Statehouse, calling for gun control. The Washington Post reported the student-led events were among the biggest youth protests since the Vietnam era, with hundreds of thousands of people turning out Saturday in the nation’s capital and more than 800 sister marches from California to Japan. (Chris Detrick | The Salt Lake Tribune) Participants listen during the March for Our Lives SLC rally at the state Capitol Saturday, March 24, 2018. The student-led March for Our Lives SLC got underway about 11:30 a.m. with what police estimated were 8,000 participants walking from Salt Lake CityÕs West High School to the front steps of the state Capitol. Organizers asked students to lead the procession, followed by educators and then adults. “Thoughts and prayers are not enough!” they chanted during the brisk march. 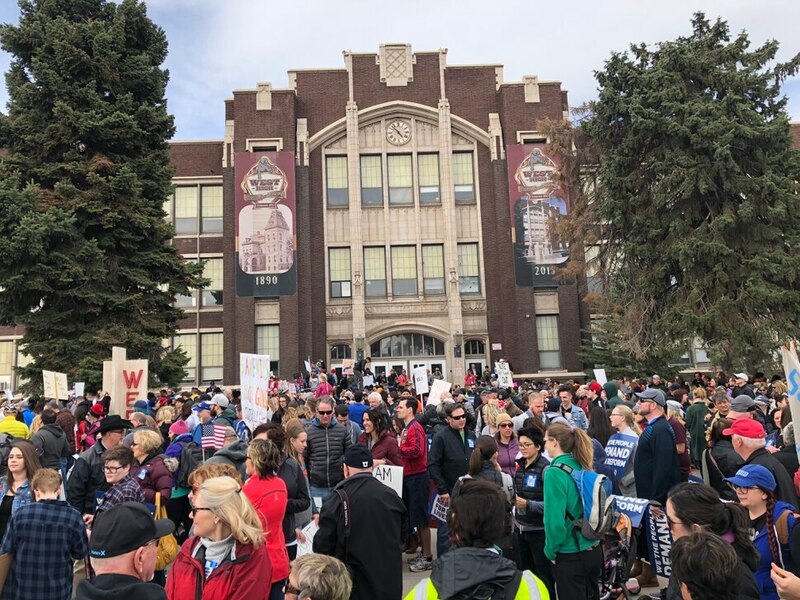 Local politicians, including Salt Lake City Mayor Jackie Biskupski and House Minority Leader Brian King, followed the crowd. A group of clergy from more than a dozen faiths also joined in. Several students described schools as the new American battleground, calling notebooks their body armor and desks their shields. “I enter a class and look for a place to hide,” said Abena Bakenra, a senior at West High School. The protests were largely peaceful — despite the presence of firepower — aside from a small verbal clash as the two groups briefly and tensely passed along the march route. (Chris Detrick | The Salt Lake Tribune) Participants march from West High School to the state Capitol during the March for Our Lives SLC Saturday, March 24, 2018. The student-led March for Our Lives SLC got underway about 11:30 a.m. with what police estimated were 8,000 participants walking from Salt Lake City’s West High School to the front steps of the state Capitol. (Lillian Reed | The Salt Lake Tribune) 14-year-olds Elizabeth Young (left) and Clara Fowler (right) pose with their signs. Both said they march today because they shouldn’t have to be afraid to go to school. (Chris Detrick | The Salt Lake Tribune) Participants hold signs during the March For Our Lives rally in Salt Lake City Saturday, March 24, 2018. (Chris Detrick | The Salt Lake Tribune) Participants march from West High School to the state Capitol during the March for Our Lives SLC Saturday, March 24, 2018. The student-led March for Our Lives SLC got underway about 11:30 a.m. with what police estimated were 8,000 participants walking from Salt Lake CityÕs West High School to the front steps of the state Capitol. (Chris Detrick | The Salt Lake Tribune) Participants hold signs during the March For Our Lives rally in Salt Lake City Saturday, March 24, 2018. (Chris Detrick | The Salt Lake Tribune) Participants hold signs during the March For Our Lives rally in Salt Lake City Saturday, March 24, 2018. (Chris Detrick | The Salt Lake Tribune) People wave to participants as they march from West High School to the state Capitol during the March for Our Lives SLC Saturday, March 24, 2018. The student-led March for Our Lives SLC got underway about 11:30 a.m. with what police estimated were 8,000 participants walking from Salt Lake CityÕs West High School to the front steps of the state Capitol. (Chris Detrick | The Salt Lake Tribune) Participants march from West High School to the state Capitol during the March for Our Lives SLC Saturday, March 24, 2018. The student-led March for Our Lives SLC got underway about 11:30 a.m. with what police estimated were 8,000 participants walking from Salt Lake CityÕs West High School to the front steps of the state Capitol. (Lillian Reed | The Salt Lake Tribune) Southern Utah University student Matthew Davis, 23, kneels while pro-gun protestors parade by the March for Our Lives on Saturday, March 24. Davis did not want to share why he kneeled but said he knew people who were hurt in the Las Vegas shooting. (Chris Detrick | The Salt Lake Tribune) (Lillian Reed | The Salt Lake Tribune) BYU students Emma Barton (left) and Summer Corry (right) pose for a photo with signs they hand made. 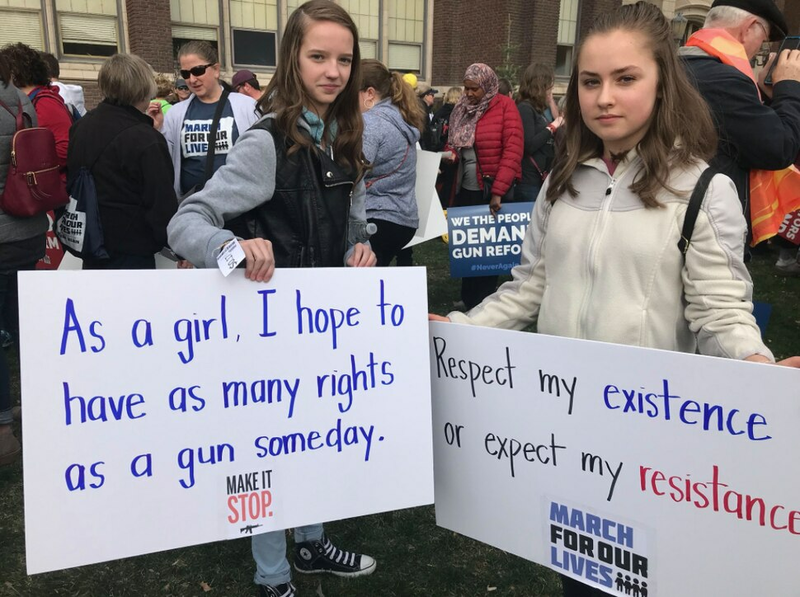 Both say they march today because better gun regulations have been needed for a long time. (Chris Detrick | The Salt Lake Tribune) Participants listen during the March for Our Lives SLC rally at the state Capitol Saturday, March 24, 2018. The student-led March for Our Lives SLC got underway about 11:30 a.m. with what police estimated were 8,000 participants walking from Salt Lake City’s West High School to the front steps of the state Capitol. (Chris Detrick | The Salt Lake Tribune) Danielle Creer 14, right, and Grace Meservy, 15, listen during the March for Our Lives SLC rally at the state Capitol Saturday, March 24, 2018. The student-led March for Our Lives SLC got underway about 11:30 a.m. with what police estimated were 8,000 participants walking from Salt Lake City’s West High School to the front steps of the state Capitol. (Chris Detrick | The Salt Lake Tribune) Participants listen during the March for Our Lives SLC rally at the state Capitol Saturday, March 24, 2018. The student-led March for Our Lives SLC got underway about 11:30 a.m. with what police estimated were 8,000 participants walking from Salt Lake City's West High School to the front steps of the state Capitol. (Chris Detrick | The Salt Lake Tribune) Participants listen during the March for Our Lives SLC rally at the state Capitol Saturday, March 24, 2018. The student-led March for Our Lives SLC got underway about 11:30 a.m. with what police estimated were 8,000 participants walking from Salt Lake City's West High School to the front steps of the state Capitol. (Chris Detrick | The Salt Lake Tribune) Participants listen during the March for Our Lives SLC rally at the state Capitol Saturday, March 24, 2018. The student-led March for Our Lives SLC got underway about 11:30 a.m. with what police estimated were 8,000 participants walking from Salt Lake City's West High School to the front steps of the state Capitol. (Chris Detrick | The Salt Lake Tribune) Participants listen during the March for Our Lives SLC rally at the state Capitol Saturday, March 24, 2018. The student-led March for Our Lives SLC got underway about 11:30 a.m. with what police estimated were 8,000 participants walking from Salt Lake City's West High School to the front steps of the state Capitol. (Chris Detrick | The Salt Lake Tribune) Participants cheer during the March for Our Lives SLC rally at the state Capitol Saturday, March 24, 2018. The student-led March for Our Lives SLC got underway about 11:30 a.m. with what police estimated were 8,000 participants walking from Salt Lake City’s West High School to the front steps of the state Capitol. (Chris Detrick | The Salt Lake Tribune) Participants hold up the peace sign as they listen to John Lennon's song 'Imagine' during the March for Our Lives SLC at the state Capitol Saturday, March 24, 2018. The student-led March for Our Lives SLC got underway about 11:30 a.m. with what police estimated were 8,000 participants walking from Salt Lake City’s West High School to the front steps of the state Capitol. (Chris Detrick | The Salt Lake Tribune) Participants hold up the peace sign as they listen to John Lennon's song 'Imagine' during the March for Our Lives SLC at the state Capitol Saturday, March 24, 2018. The student-led March for Our Lives SLC got underway about 11:30 a.m. with what police estimated were 8,000 participants walking from Salt Lake CityÕs West High School to the front steps of the state Capitol. (Chris Detrick | The Salt Lake Tribune) Participants listen during the March for Our Lives SLC rally at the state Capitol Saturday, March 24, 2018. The student-led March for Our Lives SLC got underway about 11:30 a.m. with what police estimated were 8,000 participants walking from Salt Lake CityÕs West High School to the front steps of the state Capitol. (Chris Detrick | The Salt Lake Tribune) Participants listen during the March for Our Lives SLC rally at the state Capitol Saturday, March 24, 2018. The student-led March for Our Lives SLC got underway about 11:30 a.m. with what police estimated were 8,000 participants walking from Salt Lake City's West High School to the front steps of the state Capitol. (Chris Detrick | The Salt Lake Tribune) Participants listen during the March for Our Lives SLC rally at the state Capitol Saturday, March 24, 2018. The student-led March for Our Lives SLC got underway about 11:30 a.m. with what police estimated were 8,000 participants walking from Salt Lake City’s West High School to the front steps of the state Capitol. (Chris Detrick | The Salt Lake Tribune) Participants listen during the March for Our Lives SLC rally at the state Capitol Saturday, March 24, 2018. The student-led March for Our Lives SLC got underway about 11:30 a.m. with what police estimated were 8,000 participants walking from Salt Lake CityÕs West High School to the front steps of the state Capitol. (Chris Detrick | The Salt Lake Tribune) Participants listen during the March for Our Lives SLC rally at the state Capitol Saturday, March 24, 2018. The student-led March for Our Lives SLC got underway about 11:30 a.m. with what police estimated were 8,000 participants walking from Salt Lake CityÕs West High School to the front steps of the state Capitol. (Chris Detrick | The Salt Lake Tribune) Ermiya Fanaeian and other participants march from West High School to the state Capitol during the March for Our Lives SLC Saturday, March 24, 2018. The student-led March for Our Lives SLC got underway about 11:30 a.m. with what police estimated were 8,000 participants walking from Salt Lake CityÕs West High School to the front steps of the state Capitol. (Chris Detrick | The Salt Lake Tribune) Participants march from West High School to the state Capitol during the March for Our Lives SLC Saturday, March 24, 2018. The student-led March for Our Lives SLC got underway about 11:30 a.m. with what police estimated were 8,000 participants walking from Salt Lake City’s West High School to the front steps of the state Capitol. (Chris Detrick | The Salt Lake Tribune) Participants listen during the March for Our Lives SLC rally at the state Capitol Saturday, March 24, 2018. The student-led March for Our Lives SLC got underway about 11:30 a.m. with what police estimated were 8,000 participants walking from Salt Lake City’s West High School to the front steps of the state Capitol. (Chris Detrick | The Salt Lake Tribune) Participants listen during the March for Our Lives SLC rally at the state Capitol Saturday, March 24, 2018. The student-led March for Our Lives SLC got underway about 11:30 a.m. with what police estimated were 8,000 participants walking from Salt Lake City’s West High School to the front steps of the state Capitol. (Chris Detrick | The Salt Lake Tribune) Participants march from West High School to the state Capitol during the March for Our Lives SLC Saturday, March 24, 2018. The student-led March for Our Lives SLC got underway about 11:30 a.m. with what police estimated were 8,000 participants walking from Salt Lake CityÕs West High School to the front steps of the state Capitol. (Chris Detrick | The Salt Lake Tribune) Participants march from West High School to the state Capitol during the March for Our Lives SLC Saturday, March 24, 2018. The student-led March for Our Lives SLC got underway about 11:30 a.m. with what police estimated were 8,000 participants walking from Salt Lake CityÕs West High School to the front steps of the state Capitol. (Chris Detrick | The Salt Lake Tribune) Participants march from West High School to the state Capitol during the March for Our Lives SLC Saturday, March 24, 2018. The student-led March for Our Lives SLC got underway about 11:30 a.m. with what police estimated were 8,000 participants walking from Salt Lake CityÕs West High School to the front steps of the state Capitol. (Chris Detrick | The Salt Lake Tribune) Participants listen during the March for Our Lives SLC rally at the state Capitol Saturday, March 24, 2018. The student-led March for Our Lives SLC got underway about 11:30 a.m. with what police estimated were 8,000 participants walking from Salt Lake City’s West High School to the front steps of the state Capitol. (Chris Detrick | The Salt Lake Tribune) Participants listen during the March for Our Lives SLC rally at the state Capitol Saturday, March 24, 2018. The student-led March for Our Lives SLC got underway about 11:30 a.m. with what police estimated were 8,000 participants walking from Salt Lake CityÕs West High School to the front steps of the state Capitol. (Chris Detrick | The Salt Lake Tribune) Participants march from West High School to the state Capitol during the March for Our Lives SLC Saturday, March 24, 2018. The student-led March for Our Lives SLC got underway about 11:30 a.m. with what police estimated were 8,000 participants walking from Salt Lake City’s West High School to the front steps of the state Capitol. Scott Sommerdorf | The Salt Lake Tribune Students chant on the steps of the State Capitol near the end of their rally for thousands on the south lawn after they marched from West High School, Saturday, March 24, 2018. Scott Sommerdorf | The Salt Lake Tribune A man climbed op on a concrete abutment to photograph the huge crowd on the south lawn of the Utah State Capitol for the For Our lives rally, Saturday, March 24, 2018. Scott Sommerdorf | The Salt Lake Tribune Part of the huge crowd on the south lawn of the Utah State Capitol for the For Our lives rally, Saturday, March 24, 2018. Scott Sommerdorf | The Salt Lake Tribune Part of the huge crowd on the south lawn of the Utah State Capitol for the For Our lives rally, Saturday, March 24, 2018. Matthew Davis, a student at Southern Utah University, turned his back to the nearby pro-gun advocates and kneeled. The 23-year-old said friends of his were hurt at the 2017 Las Vegas mass shooting. The protesters and counterprotesters were separated by a fence but some shouted through the holes in the chainlinks. “All rights are important” yelled one man from the gun rights side. “Move on,” responded an activist across from him. And so they did. 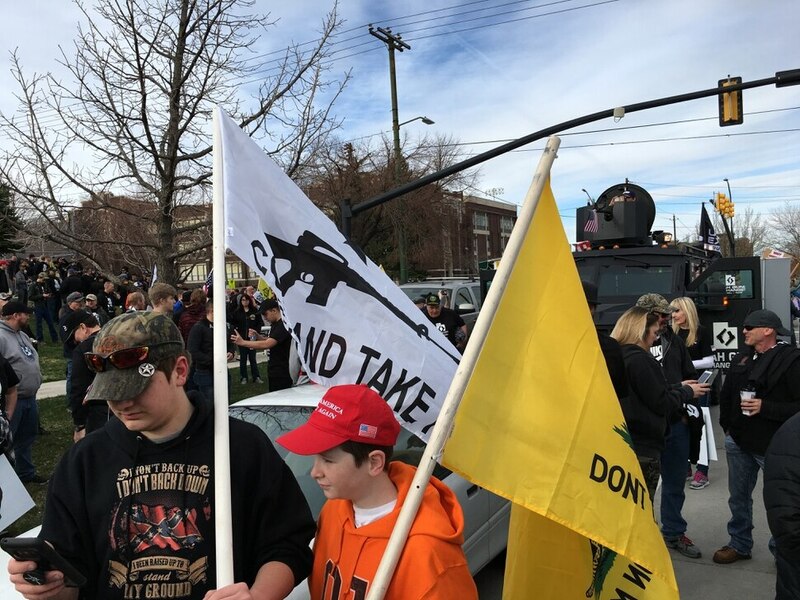 The pro-Second Amendment group turned onto North Temple with a military-grade vehicle and chants of “Freedom” and “USA.” They spanned several blocks, marching ahead of the student-led rally to show that civilian gun owners are the “frontline of defense,” Utah Gun Exchange owner Bryan Melchior suggested. He helped create the similarly named March Before Our Lives after feeling “excluded” from the day’s bigger rally. Former GOP state Rep. Chris Herrod was the only local politician to visibly join the pro-gun group. Police estimated 1,000 people participated. At least 50 were openly carrying, which is legal in Utah. 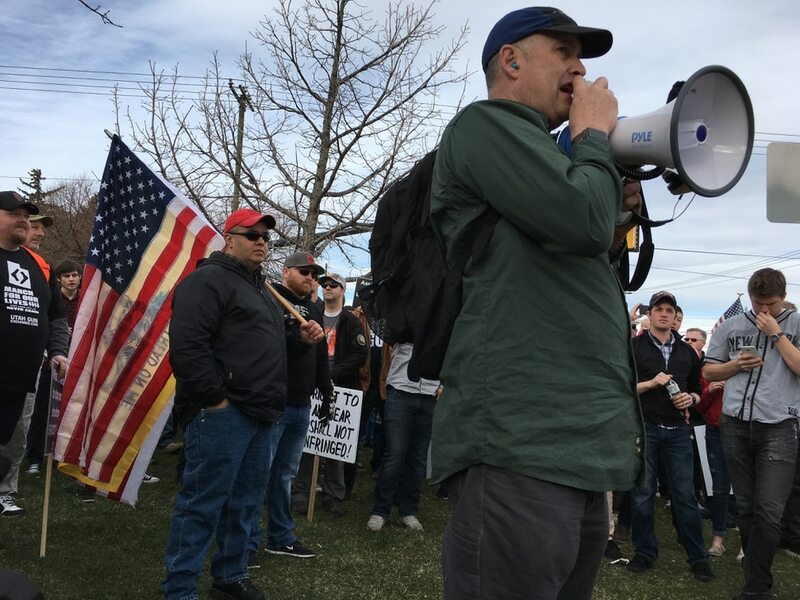 (Scott Sommerdorf | The Salt Lake Tribune) Counter-protesters, organized by Utah Gun Exchange, gather Saturday, March 24, prepare to participate in the March Before Our Lives. 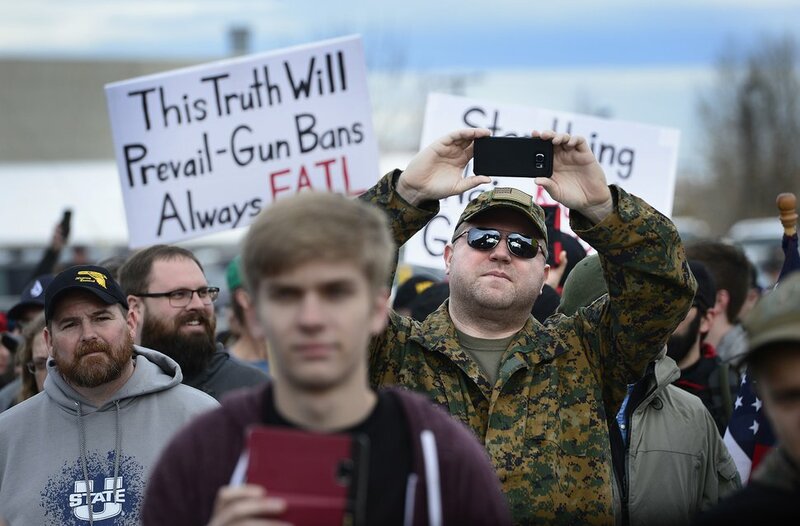 (Scott Sommerdorf | The Salt Lake Tribune) Counter-protesters, organized by Utah Gun Exchange, gather Saturday, March 24, prepare to participate in the March Before Our Lives. 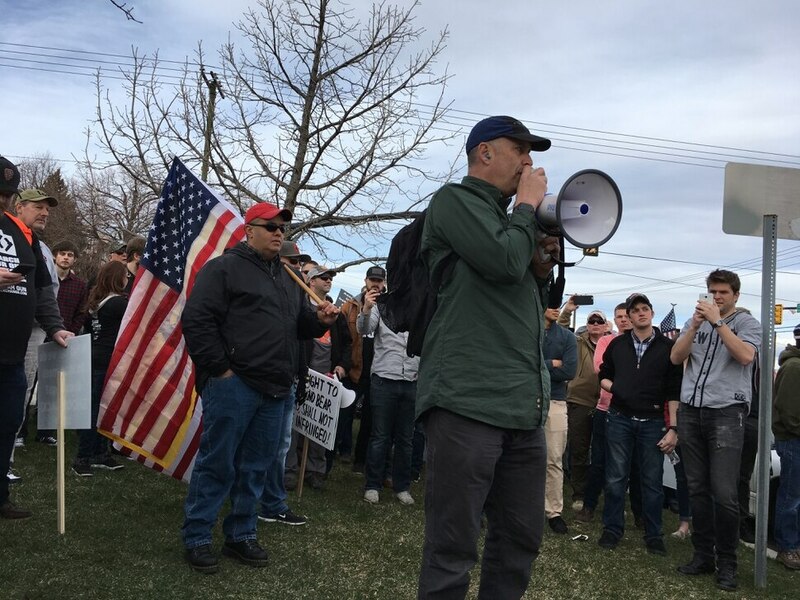 (Scott Sommerdorf | The Salt Lake Tribune) Counter-protesters, organized by Utah Gun Exchange, gather Saturday, March 24, prepare to participate in the March Before Our Lives. 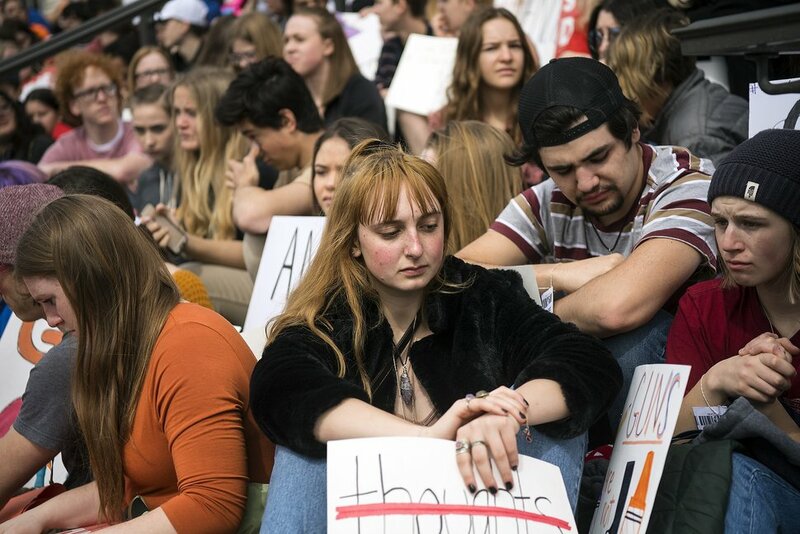 (Courtney Tanner | The Salt Lake Tribune) Trevor Steele, right, is a high school student who says banning guns is not the solution to mass shootings. 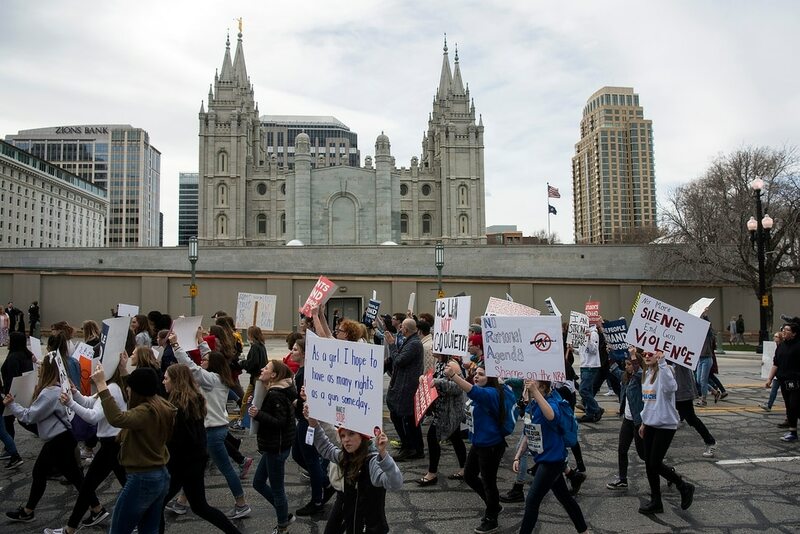 (Scott Sommerdorf | The Salt Lake Tribune) Counter-protesters, organized by Utah Gun Exchange, gather Saturday, March 24, prepare to participate in the March Before Our Lives. (Courtney Tanner | The Salt Lake Tribune) Paul Shallop and Tim Melton say their goal is same as the March For Our Lives group. They want to keep kids safe. (Courtney Tanner | The Salt Lake Tribune) A military vehicle head the March Before Our Lives counter-protesters on Saturday, March 24. (Courtney Tanner | The Salt Lake Tribune) Morgan Cox, an Army veteran participating in the March Before Our Lives, says, We both want to protect our kids. We have different ways we want it to be done. (Scott Sommerdorf | The Salt Lake Tribune) The pro-gun March Before Our lives marchers rally at West High School, Saturday, March 24, 2018. (Chris Detrick | The Salt Lake Tribune) Participants hold signs during the March Before Our Lives rally near West High School in Salt Lake City Saturday, March 24, 2018. (Courtney Tanner | The Salt Lake Tribune) Levi Rodas attends Orem High School. He's marching to show not every student is against guns after these shootings. (Chris Detrick | The Salt Lake Tribune) Participants hold signs during the March Before Our Lives rally near West High School in Salt Lake City Saturday, March 24, 2018. (Chris Detrick | The Salt Lake Tribune) Participants hold signs during the March Before Our Lives rally near West High School in Salt Lake City Saturday, March 24, 2018. (Chris Detrick | The Salt Lake Tribune) Participants hold signs as the March Before Our Lives rally walks by during the March for Our Lives rally West High School in Salt Lake City Saturday, March 24, 2018. (Chris Detrick | The Salt Lake Tribune) Participants hold signs during the March Before Our Lives rally near West High School in Salt Lake City Saturday, March 24, 2018. (Chris Detrick | The Salt Lake Tribune) Participants hold signs during the March Before Our Lives rally near West High School in Salt Lake City Saturday, March 24, 2018. (Chris Detrick | The Salt Lake Tribune) Participants hold signs during the March Before Our Lives rally near West High School in Salt Lake City Saturday, March 24, 2018. (Chris Detrick | The Salt Lake Tribune) Participants hold signs during the March Before Our Lives rally near West High School in Salt Lake City Saturday, March 24, 2018. (Chris Detrick | The Salt Lake Tribune) Participants hold signs during the March Before Our Lives rally near West High School in Salt Lake City Saturday, March 24, 2018. (Chris Detrick | The Salt Lake Tribune) Participants hold signs during the March Before Our Lives rally near West High School in Salt Lake City Saturday, March 24, 2018. (Chris Detrick | The Salt Lake Tribune) Participants hold signs during the March Before Our Lives rally near West High School in Salt Lake City Saturday, March 24, 2018. (Chris Detrick | The Salt Lake Tribune) Participants hold signs during the March Before Our Lives rally near West High School in Salt Lake City Saturday, March 24, 2018. (Chris Detrick | The Salt Lake Tribune) Participants yell at people gathered for the March for Our Lives rally during the March Before Our Lives rally near West High School in Salt lake City Saturday, March 24, 2018. (Chris Detrick | The Salt Lake Tribune) Participants hold signs during the March Before Our Lives rally near West High School in Salt Lake City Saturday, March 24, 2018. (Chris Detrick | The Salt Lake Tribune) Participants hold signs during the March Before Our Lives rally near West High School in Salt Lake City Saturday, March 24, 2018. (Chris Detrick | The Salt Lake Tribune) Participants hold signs during the March Before Our Lives rally near West High School in Salt Lake City Saturday, March 24, 2018. (Scott Sommerdorf | The Salt Lake Tribune) Pro-gun March Before Our lives marchers shout at members of the media as they march up State Street to the Utah State Capitol building, Saturday, March 24, 2018. (Scott Sommerdorf | The Salt Lake Tribune) The pro gun March Before Our lives marchers begin their march to the Capitol building from West High School, Saturday, March 24, 2018. (Scott Sommerdorf | The Salt Lake Tribune) Pro gun March Before Our lives marchers shout at members of the media as they march up State Street to the Utah State Capitol building, Saturday, March 24, 2018. (Scott Sommerdorf | The Salt Lake Tribune) The pro gun March Before Our lives marchers march up State Street to the Utah State Capitol building, Saturday, March 24, 2018. (Scott Sommerdorf | The Salt Lake Tribune) The pro gun March Before Our lives marchers rally at West High School, Saturday, March 24, 2018. (Scott Sommerdorf | The Salt Lake Tribune) The pro gun March Before Our lives rallied at the Utah State Capitol after their march from West High School, Saturday, March 24, 2018. (Scott Sommerdorf | The Salt Lake Tribune) The pro gun March Before Our lives rallied at the Utah State Capitol after their march from West High School, Saturday, March 24, 2018. (Scott Sommerdorf | The Salt Lake Tribune) The pro gun March Before Our lives rallied at the Utah State Capitol after their march from West High School, Saturday, March 24, 2018. (Scott Sommerdorf | The Salt Lake Tribune) The pro gun March Before Our lives rallied at the Utah State Capitol after their march from West High School, Saturday, March 24, 2018. (Scott Sommerdorf | The Salt Lake Tribune) The pro gun March Before Our lives rallied at the Utah State Capitol after their march from West High School, Saturday, March 24, 2018. (Scott Sommerdorf | The Salt Lake Tribune) The pro gun March Before Our lives rallied at the Utah State Capitol after their march from West High School, Saturday, March 24, 2018. (Scott Sommerdorf | The Salt Lake Tribune) The pro gun March Before Our lives rallied at the Utah State Capitol after their march from West High School, Saturday, March 24, 2018. (Scott Sommerdorf | The Salt Lake Tribune) The pro gun March Before Our lives rallied at the Utah State Capitol after their march from West High School, Saturday, March 24, 2018. Scott Sommerdorf | The Salt Lake Tribune A man who refused to give his name because he claimed he was mis-identified as a counter protestor at a previous rally stood with pro-gun March Before Our lives marchers as they rallied across the street from West High School, Saturday, March 24, 2018. Scott Sommerdorf | The Salt Lake Tribune Pro-gun March Before Our lives marchers rally across the street from West High School, Saturday, March 24, 2018. Scott Sommerdorf | The Salt Lake Tribune Pro-gun March Before Our lives marchers rally across the street from West High School, Saturday, March 24, 2018. Scott Sommerdorf | The Salt Lake Tribune Pro-gun March Before Our lives marchers rally across the street from West High School, Saturday, March 24, 2018. Scott Sommerdorf | The Salt Lake Tribune A woman with a pro-NRA shirt held a baby as pro-gun March Before Our Lives marchers rallied across the street from West High School, Saturday, March 24, 2018. Scott Sommerdorf | The Salt Lake Tribune David Woodward, a teacher at Ascent Academy in Farmington, marched with his daughter as pro gun March Before Our Lives marchers rallied across the street from West High School, Saturday, March 24, 2018. Scott Sommerdorf | The Salt Lake Tribune A man who identified himself as Nutin Fancy spoke over a bullhorn to pro gun March Before Our Lives marchers as they rallied across the street from West High School, Saturday, March 24, 2018. Scott Sommerdorf | The Salt Lake Tribune Zach Dunn of Salt Lake City carried his Glock 9mm as he rallied with other pro-gun March Before Our lives marchers across the street from West High School, Saturday, March 24, 2018. Scott Sommerdorf | The Salt Lake Tribune Pro-gun March Before Our Lives marchers rally across the street from West High School, Saturday, March 24, 2018. “We believe that we can protect people,” said Boston Carvahlo, 21, who works on his family’s alfalfa farm in southern Utah County. He and his friend Roger Halford had handguns on their waists. Another marcher held a banner with the image of an assault rifle above the challenge “Come and take it.” Demonstrators wore black shirts and red hats with President Donald Trump’s “Make America Great Again” campaign motto. Some carried “Don’t Tread on Me” flags. One man had “We the People” tattooed on his left arm. Another carried a worn copy of the Constitution in his back pocket. Levi Rodas, 16, was one of the few students to join the March Before Our Lives rally. He attends Orem High School and proudly said he did not join this month’s nationwide walkouts in which teens left class calling for gun reform. “Not every student is against guns after these shootings,” he said. The solution to stopping violence in schools, Rodas believes, is adding more security officers — not limiting rights or restricting access to firearms. He followed a like-minded group to the back of the Capitol. Scott Sommerdorf | The Salt Lake Tribune Pro-gun March Before Our lives marchers rally across the street from West High School, Saturday, March 24, 2018. March for Our Lives SLC, which reserved the space first, stood at the front of the building, where six students gave speeches, one performed slam poetry composed the day of the Florida shooting and one led the crowd in a rendition of “Imagine” by John Lennon. Thousands filled the Statehouse’s steps during the performance, making peace signs with their hands and swaying gently with the music. Protesters continued to walk up the street and file onto the lawn through the first 15 minutes of the event. Comments from the speakers often were met with cheers or nodding heads. Bakenra began the event with a declaration: Students are no longer accepting thoughts and prayers, only policy and action. Ermiya Fanaeian, 17, spoke of the experience of students of color and what she said is disproportionate attention given to white victims of gun violence. The firearm protections advocated by the counterprotesters, she said, do not work. “These stricter security methods already exist in schools with students of color,” Fanaeian said. Students also did not mince words for previous generations, recalling a lack of legislative action following the shootings at Columbine High School in 1999 and Sandy Hook Elementary School in 2012. “Generations before us have failed miserably,” 18-year-old Isaac Reese said. The pro-gun rally speakers embraced their “First Amendment rights” through an open mic minutes before peacefully melding into March for Our Lives SLC, noticeable only for the opposing messages on their posters. Katherine Meyer, 17, a student at the Utah Military Academy, repeated the common refrain that weapons don’t kill people: “An inanimate gun cannot fire itself.” Morgan Cox, an Army veteran, said new laws won’t make a difference because criminals don’t follow existing firearm restrictions. The student protest had a three-pronged list of legislative demands — a ban on “military grade, assault-style” weapons, expanded background checks for purchasing firearms and mandatory waiting periods between a purchase and pickup of a gun. Instead of widening gun control, counterprotesters called for more safeguards in mental health treatment and bringing care and convalescence to those in need.